I am so excited at the opportunity to try out for Emma's design team. I knew I wanted to do a home decor project but had to figure out what to create. I wanted something simple but packs a lot of punch and look beautiful on display. So here it is, my masterpiece! The green base paper is 12 x 12 and the wreath is cut at 8 in. You can see displayed on my book case it looks so pretty. Would also look nice hanging in a shadow box. I layered red and green Christmas papers and added my favorite doily boarder punch from Martha Stewart in white. I love that country look it gives. I added buttons and twine to finish the edges off. The wreath itself is a scalloped circle cut from the Winter Woodland Cricut cartridge, with a circle cut from the center. I topped the page in a red checked bow and tied the entire project together with a stamp from my favorite set Mixed Holiday Sentiments. I hope you enjoyed my submission and I look forward to showcasing more of my craftiness soon. 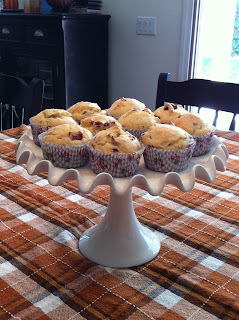 The weather is beautiful and my girls were playing in the backyard so I baked up some yummy cranberry muffins. My house smells amazing. Just like a lovely Fall day. I'm so happy I had to share. Hope you all have a wonderful day! Welcome to the 2nd Sketch Blog Hop. The first hop last month was so popular we decided to do it again!!! The purpose of this hop is to show how all of these talented bloggers can take the same sketch and come up with totally different cards. If you've never used a card sketch before, give it a try! Be sure to check back on Sunday, as there will be some bloggers posting cards on day 2. So sit back & be inspired! If you just happened on the hop, be sure to go to the first stop www.craftycardgallery.blogspot.com so you can see the whole hop! Grab your favorite beverage and sit back & hop along with us! Since I am on a cupcake kick I decided to create a cupcake card for this hop. I hope you like it! The cupcake was cut from the Sweet Treats Cricut cartridge at 2 inches. I layered it on top of red rickrack, then embellished the bottom with three little cookie cutter buttons I backed with coordinating paper. A simple stamped sentiment from My Creative Time stamps on top was just perfect for my sweet card. The border punch is Martha Stewart doily punch. I added some stickles for a little sparkle. There you have it, my sketch inspired creation. Please hop along to all the blogs on the list and see what my fellow bloggers have made. Thanks for stopping by. COME BACK SOON! I thought it would be nice for my 2 1/2 and 3 1/2 year old girls to do an easy Halloween project tonight so this is what I came up with. I started with a pumpkin cut from the Create a Critter Cricut cartridge. I cut it fit to page so it's pretty big. I covered the stem in green paper and inked the edges with Tim Holtz fall limited edition ink. I punched out some triangles and scalloped triangles in a shimmery black paper and let the girls stick them on with pop dots. And here they are hanging on my fridge. Really simple for the little kids and they enjoyed making them. Thanks for stopping by and COME BACK SOON! For the challenge we had to use a font Cricut cartridge. So I used the Christmas tree cut from Lyrical Letters. I cut it out at 4 inches and placed it on white cardstock and used it as a screen. Then I used several different glimmer mist colors to paint over the tree image. I blotted off the excess paint, removed the tree cut and let the card dry a few minutes. Once it was dry I cut it down and mounted it on pink glitter cardstock. I embellished with tinsel trim, some bling, brads, and stickles. Last but not least I stamped Merry Christmas from Emma's Gift Card Sentiments set. There you go! A cute card alternative to Christmas red and green. 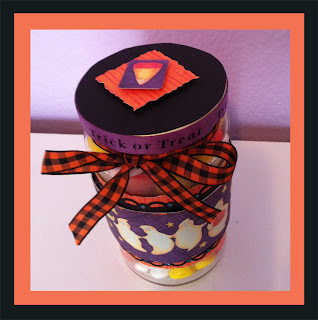 Halloween Treat Box Blog Hop! Welcome to my first blog hop! I am so excited to show you what I have created. 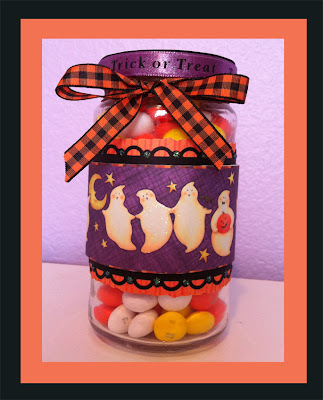 For this hop I decided to make a treat jar. They are easy to come by, simple to make over, and fabulous as gifts. So here we go! I saved a jelly jar just for this project. Removed the label and washed and dried it. I trimmed a strip of orange paper with deckle edge scissors and glued it to the jar. 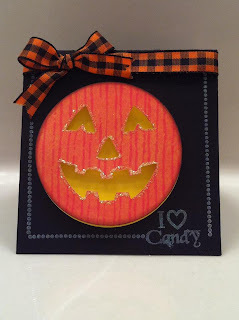 I then used my scallop punch to edge the black paper then cut a strip of my patterned Halloween paper. Layered it all together and added some stickles for sparkle and the base is done. For the lid I wrapped the edge with trick or treat ribbon then covered the top with black cardstock and a couple decorative paper pieces popped up with foam. Tied a bow in orange and black checked ribbon around the top. And there you have it, my Halloween Treat Jar! I hope you enjoyed visitng my blog. Please follow me if you would like to see more. I have lots of great things in the works for the upcoming holiday season. COME BACK SOON! I made a cute little card today at my friend Melissa's house. She invited me over for an afternoon of food, wine, and crafting! I hope you like it. I did a 3x3 black card. Stamped the dotted outline and sentiment in white ink and embossed with clear glitter powder. The pumpkin is a 2 in circle punch with the face punched out using the Martha Stewart punch all over the page Jack-o-lantern face. I backed it with a yellow circle also punched with the 2 in circle punch. Finished it off with stickle accents and Halloween bow at the top. Very easy and very cute. My kind of crafting.